Hi there boys and girls! This is The Lunch Laddy comin’ at ya with a new chapter of The Lunch Lady Cookbook. This week’s theme is Campfire Cookin’ in the Kitchen, one man’s harrowing tale of survival and redemption during (a 2 hour) power outage. We had some blustery weather recently. Actually, more like 24 hours of sustained high winds, with gusts up to 50 miles per hour. Not exactly Hurricane Sandy, but enough to blow your hat off and take down trees and power lines. We used to lose power all the time up here in God’s country. In fact, it seemed that the power would go out every time I sneezed or passed more gas than usual. Although things have recently improved in at least one of those areas, it’s still “lights out” in blustery high winds, which brings us to the point of this chapter. When I awoke to the sound of howling wind and the lights winking out, my first concern was survival. Survival, as in “How the Hell am I gonna make coffee?” Fortunately, my days as a Boy Scout taught me more than how to execute the J stroke with a canoe paddle or how to weave a lanyard. It burned the phrase: “Be Prepared” into the very core of my being. 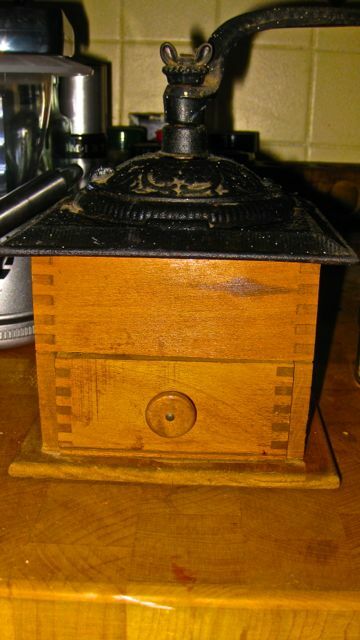 I have an old fashioned hand powered coffee grinder for occasions such as this. While it may look like something from Little House on the Prairie it gets the job done and grinds those beans as good as my fancy schmancy high tech Cuisinart coffee grinder. Then there’s the problem of heating water. The Lunch Laddy’s primary stove is electric. 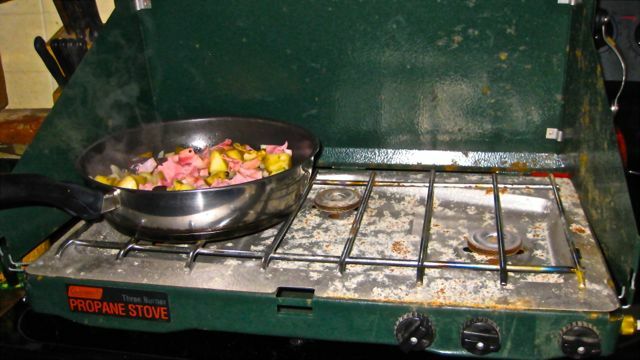 I know, “Electric stove? Blasphemy!” you say. But you work with what you got. I do have a wood stove that I could hang a cauldron over, but it wasn’t necessary to go totally American Colonial quite yet. A quick rummage through the Lunch Laddy’s well stocked Apocalypse Closet produced a three burner Coleman camp stove and a propane supply that could barbecue enough yak meat to feed Batu Khan’s Golden Horde. After a bit of fumbling around, I managed to set up the stove and singe my hair and eyebrows in the process of lighting one of the burners. With the immediate crisis averted and caffeine now properly stimulating my frontal cortex, I turned my attention to cooking breakfast. I contemplated my fate as the January winds howled and moaned outside the frost covered windows, and asked myself, what would Jack London do? I imagined him calling: “ A whisk! A whisk! 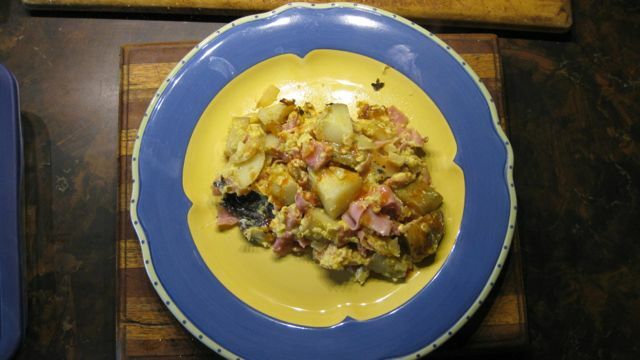 My kingdom for a whisk!” While I didn’t have all the fixin’s that a cook in a Klondike gold mining camp might have had, such as fatback, sourdough biscuits & redeye, I did have ham & potatoes & eggs & cheese. 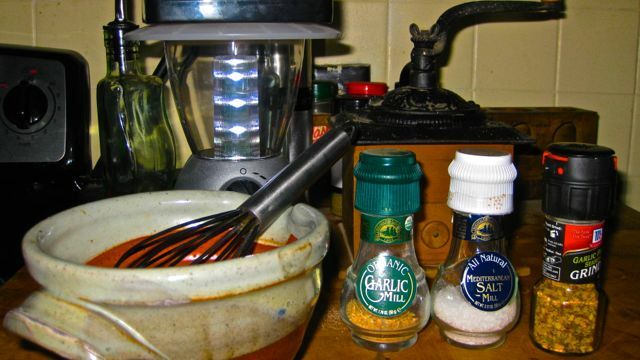 I also had a secret weapon to pull it all together ~ Dave’s Gourmet Insanity Sauce. (TM) More on that in a bit. Now, I present to you the Lunch Lady Mining Camp Scramble. Chop potatoes into small pieces and throw ‘em in the pan. Keep tossing and turning until they start to soften up and turn brown and crispy. This may take a while. Add chopped onions and ham. 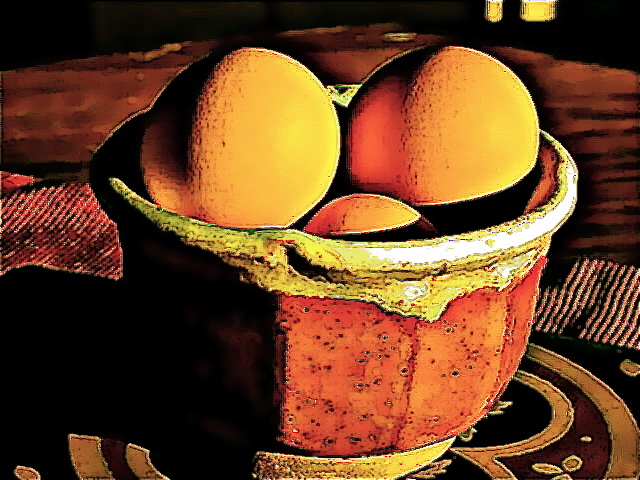 Combine eggs, worcester sauce, milk and spice in mixing bowl. Whisk vigorously. Toss it all into the pan, scrambling, turning, whisking, tossing and flogging continuously. Add cheese and continue the above contortions until cheese is melted. Serve immediately. Garnish with hot sauce for an extra kick. OK ~ so here’s the thing with the hot sauce. Pay attention to the label! You think I’m kidding? I’m not! 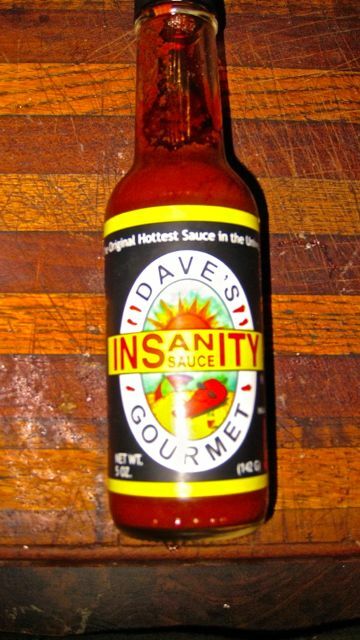 Dave’s Gourmet Insanity Sauce is a high quality product. While it does come with several caveats on the label, I think it should also come with nuclear launch codes. The label says “The Original Hottest Sauce in the Universe!” I am now a true believer. It is every bit of that and more. It’s described as “A great cooking ingredient for sauces, soups and stews. Also, strips waxed floors and removes driveway grease stains.” But here’s the IMPORTANT part, so PAY ATTENTION. It says “use one drop at a time.” Did you hear me? I said ONE. DROP. AT. A. TIME! Don’t make the same mistake I did, and slather it on your eggs, because it is FIRE in the HOLE Baby ~ Goin’ in and comin’ out! By the way, the power came back on before I finished cooking breakfast. At least now I know that I can survive campfire cookin’ in the kitchen and if Dave’s Gourmet Insanity Sauce doesn’t actually cause the Apocalypse, it will help me survive it. Until next time, savor life one drop at a time and eat hearty maties! Haha! Thanks Ruth! I don’t know…sometime, I think (hope?) …as you can see, I haven’t really thought it out yet…but I’ll let you know. haha! LOVED this, Michael! Man, that is one cool coffee grinder w/ the crank! LOVE it! 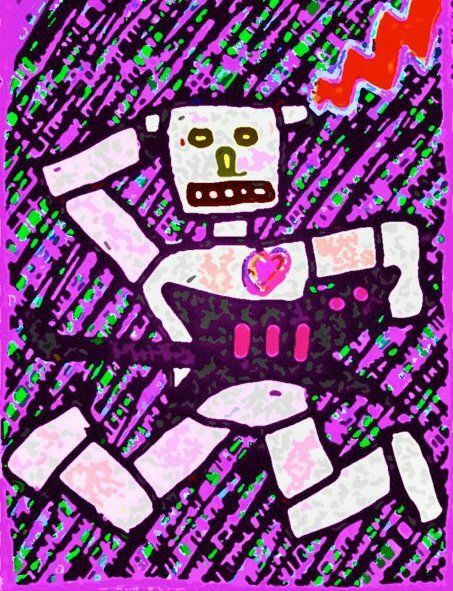 You rock it! So glad you survived and had that boy scout training under your belt. Thanks Meg! I so appreciate your comment in this storm blown location of the Northeast! Thanks so much for visiting and commenting! Your post provided me with a great read, a delicious breakfast & motivation to clean off the old butane grill burner in the event Nemo treats us badly. So far… All is well. As it should be. Thanks for the post. Thanks Fred! Fine on this end too. About to go out and shovel now. Hi ho hi ho! Yes, I so love that coffee grinder! I read this while having my morning coffee and now want that morning breakfast. Ugh. If only I weren’t so lazy. Enjoyed this post…have been wondering where you were w/ these! Haha! Yes Jules! Thanks! I have ideas for more on deck. Just been really swamped with some other stuff and most of my creative writing chops are invested in a weekly writing circle and editing for JMWW. All have been really productive, but at the same time, distracting from my other shenanigans, like The Lunch Lady Cookbook, etc. Thanks for reading and commenting.